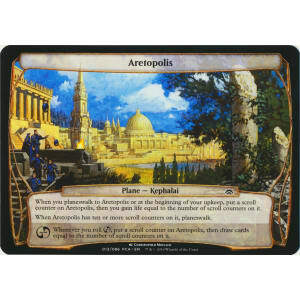 When you planeswalk to Aretopolis or at the beginning of your upkeep, put a scroll counter on Aretopolis, then you gain life equal to the number of scroll counters on it. When Aretopolis has ten or more scroll counters on it, planeswalk. 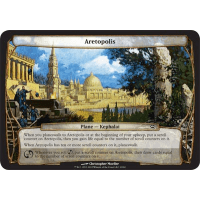 Whenever you roll chaos, put a scroll counter on Aretopolis, then draw cards equal to the number of scroll counters on it.